Asiatic wins contract to supply KeKelit pipes & fittings for both the cold & hot water systems for the hotels in the USD3.6 billion development - Marina Bay Sands. 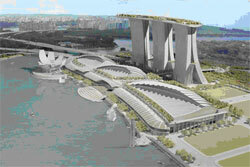 The Marina Bay Sands is located in the Marina Bay area in Southern Singapore. It is the first Integrated Resort (IR) project in Singapore including a combination of convention and exhibition space, a wide range of leisure facilities and impressive public spaces. The resort will feature three soaring hotel towers crowned by a Sky Park bridging the towers. The lower buildings will comprise of an Art-Science Museum, retail space, a convention and exhibition center, two theatres and a casino.